Will Vandergriff | Alaska State House of Representatives Dec 4, 2014. Anchorage, Alaska – Incoming leaders of the Alaska House Majority Caucus welcomed Alaska’s 11th Governor, Bill Walker, into office Tuesday, along with his Lieutenant Governor, Byron Mallott. The Majority worked with the prior administration over the past three years to reign in state spending, seeing reductions in the operating budget each year, culminating in last year’s two percent decrease. 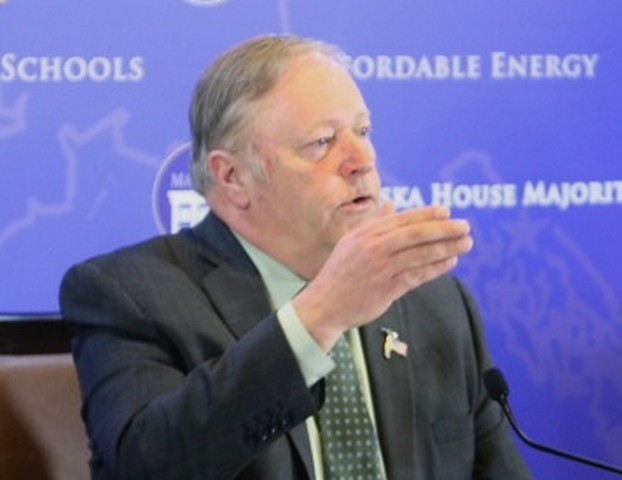 Majority leaders are awaiting the new governor’s proposed FY 2016 operating budget and supplemental budget for the current fiscal year, in light of the lower than forecast North Slope crude oil prices, and Walker’s campaign promises to expand Medicaid while cutting the budget by 16 percent. The House Majority has made fiscal responsibility one of its Guiding Principles for the past three Legislatures, and members have followed up on that pledge by reducing state spending on operations, passing comprehensive state department audit requirements, long range fiscal planning for agencies and creating a Finance Subcommittee on fiscal issues. Governor Walker was sworn into office yesterday, Monday, Dec. 1. The Legislature convenes Jan. 20 in Juneau.